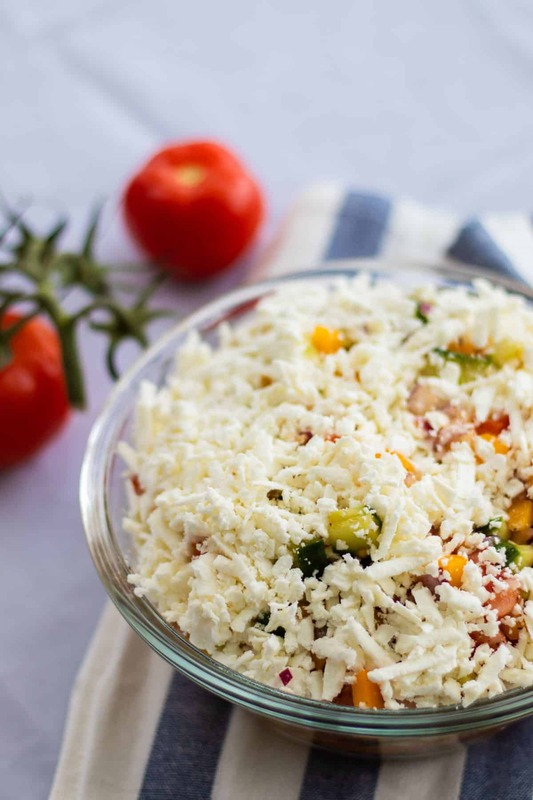 Light and summery – the Shopska Salad is a delicious meal on it’s own, with a piece of bread, or next to a barbecue. 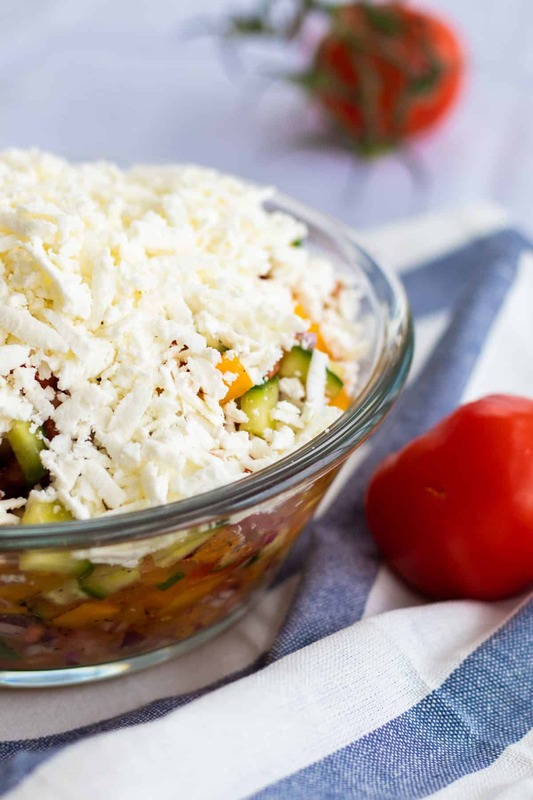 Made from cucumber, tomato, red onion and bell pepper, mixed with a simple vinaigrette and topped with Feta cheese, it’s so colorful and filled with taste. Some of the links below are Amazon affiliate links. This means that if you buy something through one of them, I receive a small commission (at no extra cost to you). What is a Shopska Salad? 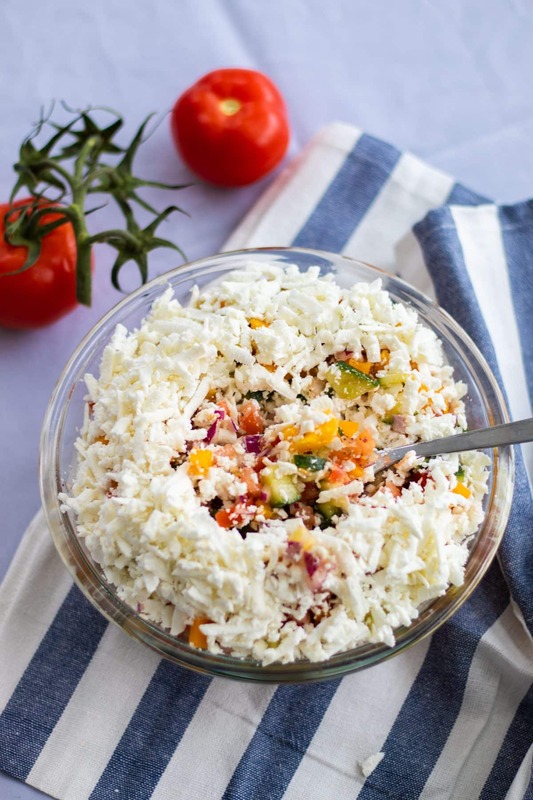 Shopska is a fresh, summery salad, made from cucumber, tomato, onion (and sometimes bell pepper) with a light vinaigrette and white Feta-type cheese. Sometimes parsley is added – sometimes not. Delicious on its own, even better as a side for a nice barbecue – or if you’re me, on top of a roasted piece of bread. And even better next to a glass of crisp rosé! And for ultimate points? Lakeside in the Macedonian town of Ohrid, next to the previously mentioned glass of crisp rosé and accompanied by 30 degrees of beaming sunshine. Aah, I’m just about ready for summer now!! Where does the Shopska salad come from? The short answer is: it depends on who you’re asking. And if you’re Greek – you’d probably say: “Well, it’s actually Greek – you just took a Greek salad and put it through a blender!”. The truth is – all these countries (and probably many more) have their own version of the Shopska salad. In Greek you’ll get it in larger pieces and in Turkey it will probably have lemon & pomegranate – but it’s the same concept. All made with that specific country’s own version of Feta-type-cheese. Either way – a delicious, simple, salad. Chopping your veggies is really the hardest part of making this salad. But here’s the thing – you can decide just how tiny you want your pieces to be. I like them really small – I feel like it’s the best way to get the flavors all mixed and yummy. It makes it almost like a salsa, and who doesn’t love a good salsa? It’s so yummy with larger pieces as well though so please don’t let the chopping discourage you! 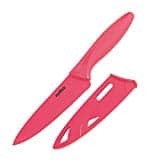 Or just make sure you have a good knife – I hated chopping before I got a really good knife (my favorite right now is the Kai Wasabi 8-inch Chef’s Knife). If you’re gonna chop one thing and one thing only into very small pieces – go for the red onion. I don’t know about you, but I’m not a big fan of biting into a big piece of onion. Cucumber, tomatoes and bell pepper though – that’s a whole other thing! 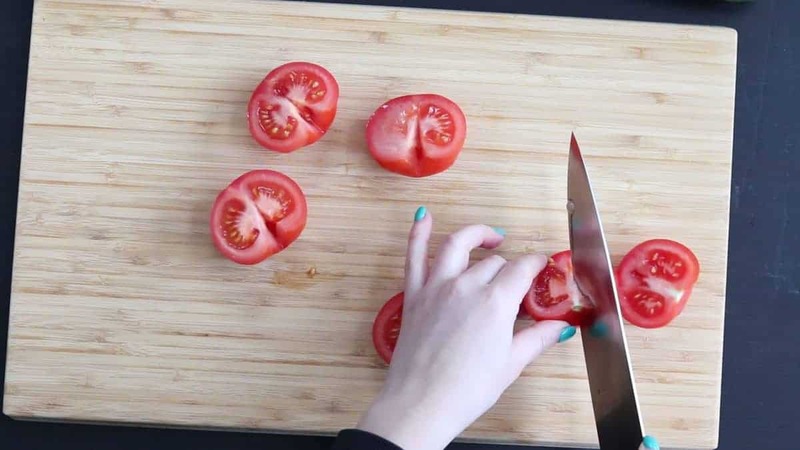 I also always remove the tough stem part of the tomatoes – totally optional, but I don’t like eating it and it’s so easy to just remove you chop them. 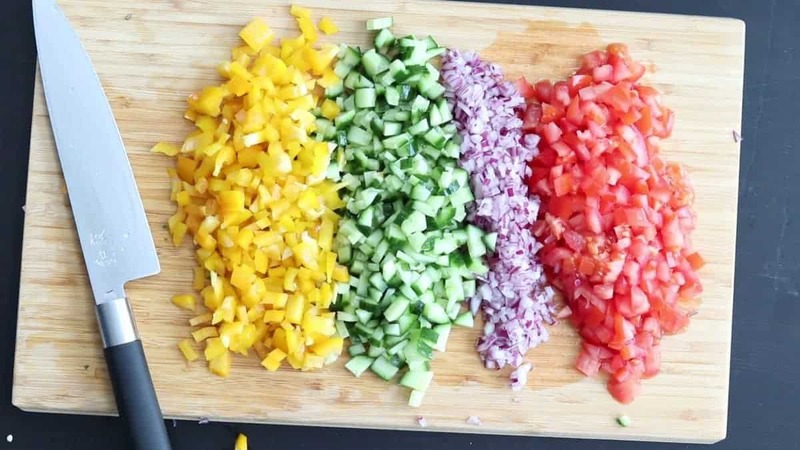 Speaking about veggies – you can definitely substitute yellow bell pepper for another color (although the yellow color complements the tomato & cucumber nicely, and provides some nice sweetness) and red onion for yellow onion or even shallots. Once again – use what you have or can easily get your hands on! 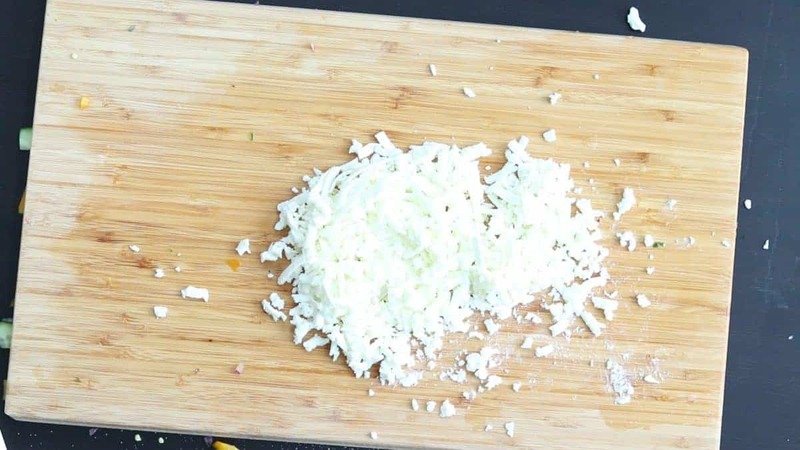 After chopping the veggies according to knife skills & patience, shred the Feta cheese. 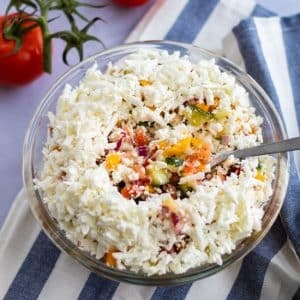 You can crumble it as well, but as the first ever Shopska salad I had was with shredded Feta cheese this is what I go for. I don’t know, I feel like it actually does add even more taste as well? But that could be 100% in my head. So just crumble it if you like, or if you just want less dishes. 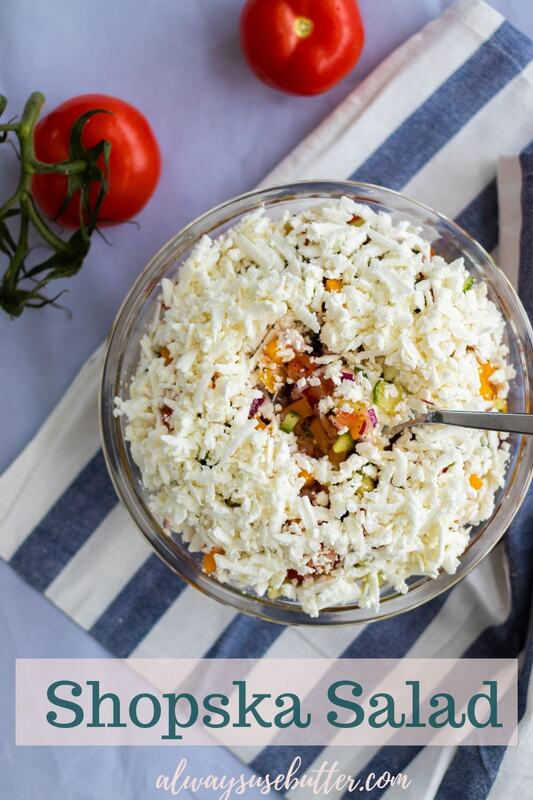 Now might also be the time to point out that you can use any other Feta-type cheese as well. Just choose whatever is easily accessible to you. For me – that’s Feta, because there’s always some Feta in my fridge. Now for step 2, the vinaigrette is also super easy to make. 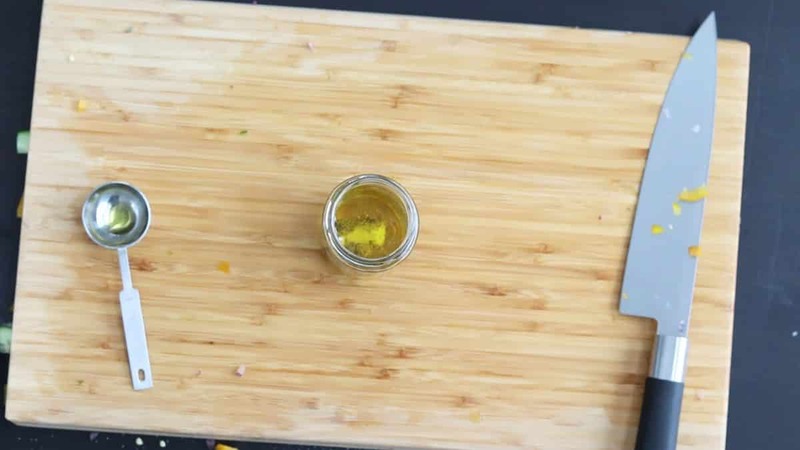 With just 4 ingredients – all of which are staples in most homes – it really is the most basic, yet delicious, vinaigrette you could imagine. You’ll notice I stray a bit from the standard 1-to-3 ratio of vinegar to oil. This is not a specific Shopska thing (as far as I know at least! ), I just like a bit more bite to my vinaigrette – which makes 1-to-2 the perfect ratio! Now there are so many vinegars you could use for this recipe. The classic I believe is a red wine vinegar, which is really yummy. But I love my Apple Cider Vinegar. Not only do I enjoy the taste more than that of red wine vinegar, but it also has so many health benefits (remember, I even put it into this January’s Detox Cocktail!). Which makes it a no-brainer to me – if I don’t see any benefits from using another type of vinegar, I’ll go for ACV. If you don’t have ACV, or just don’t like it – go for the vinegar you have. No need to buy a new one for this. Red wine vinegar is the classic, but white wine vinegar works as well. Balsamic will change the flavor profile a bit, but it will still be yummy. And in a pinch you could squeeze in some lemon instead. My best tip for making a vinaigrette? Use a jar. Yes, a jar. A simple, glass jar – I save all the sun-dried tomato and peanut butter and whatever else jars I empty off contents and then use them for just this type of thing. Just add in your ingredients, put on the lid (make sure it’s really tight!) and shake it. Shake it well. Shake it like it’s a maraca and you’re in 3rd grade music class. (Or more, depending on how enthusiastic you were about 3rd grade music class.) And that’s it. 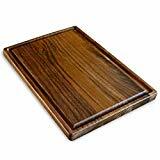 Now that the vinaigrette is finished – time has come to put everything together. I like to mix my veggies and vinaigrette in a large bowl – not necessarily my serving bowl – just because it makes it so easy. But once again – mix it directly in your serving bowl if you want to minimize dishes. Either way – place all your veggies in a bowl and our over the vinaigrette. Mix well, and transfer to your serving bowl if you’re not already using it. I like to use glass for serving pretty salads like this. Once the veggies & vinaigrette are mixed and ready in the serving bowl, top it all with those fine shreds (or crumbles!) of feta cheese. 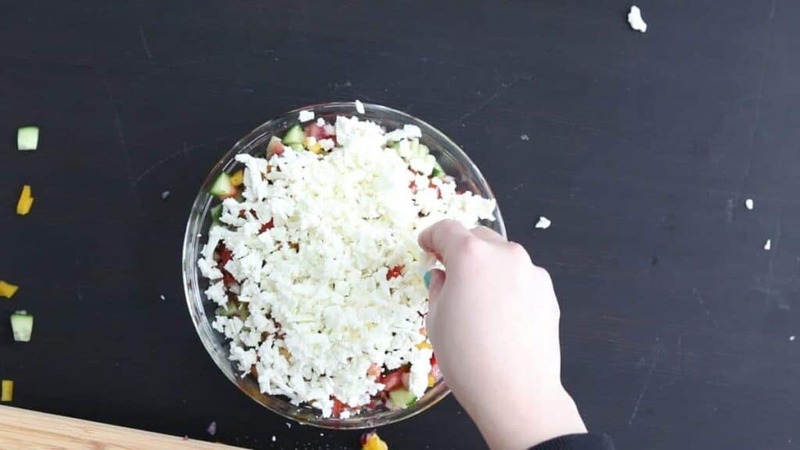 Have you tried a Shopska salad before? Is it Macedonian or Bulgarian to you, or maybe something else entirely? Let me know in the comments below! 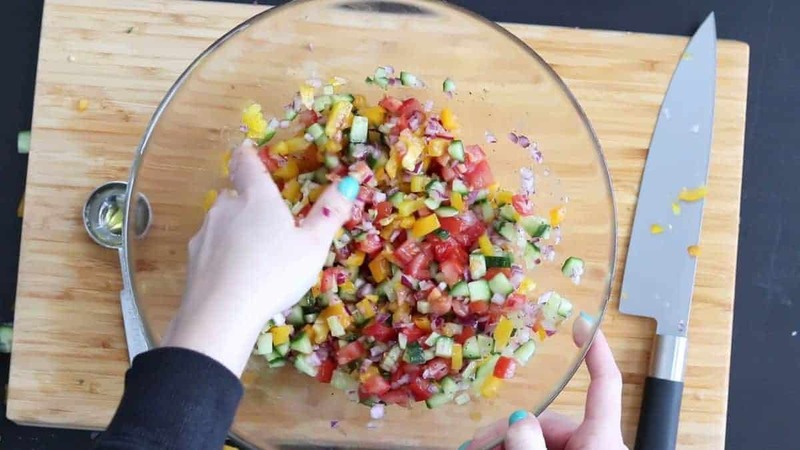 Place all the chopped vegetables in a large mixing bowl. Make the vinaigrette! 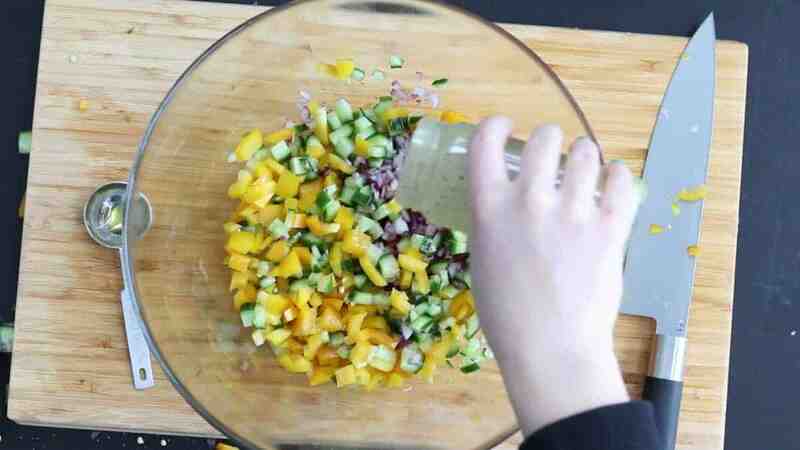 Place the ingredients for the vinaigrette in a jar and close the lid tightly. Shake well until combined. 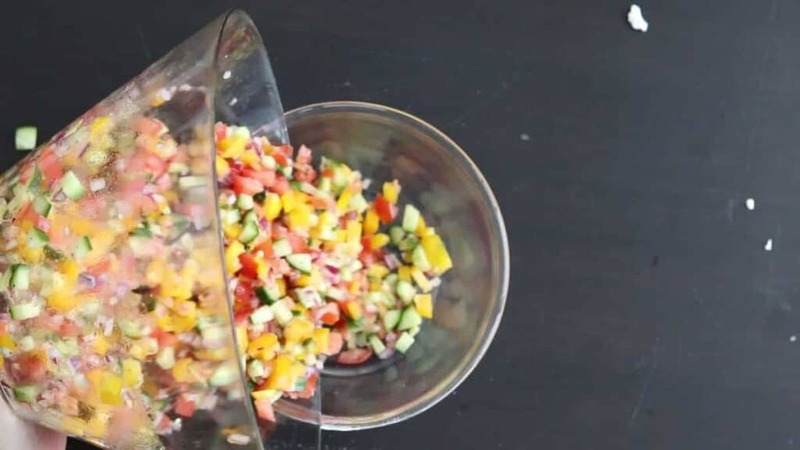 Pour the vinaigrette over the chopped vegetables, mix well and transfer to a serving bowl. 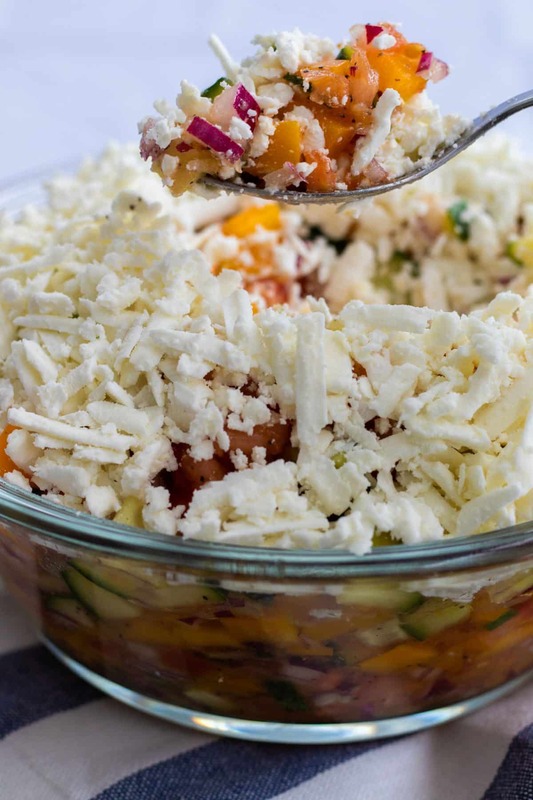 Top the salad with shredded Feta cheese, and serve. The calories for this recipe is for one portion served as a side dish – and assumes 3/4 of the vinaigrette is consumed. Instead of Apple Cider Vinegar you can use another vinegar, for exampe red wine vinegar or white wine vinegar. 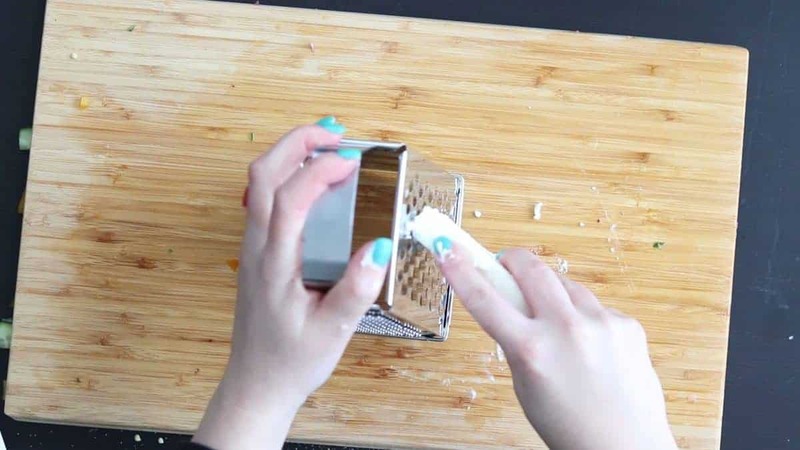 Instead of Feta cheese you can use another white Feta-type cheese. Instead of yellow bell pepper you can use another color of bell pepper, but the yellow color complements the tomato and cucumber nicely and provides some nice sweetness. Instead of red onion you can use yellow onion, or even shallots. 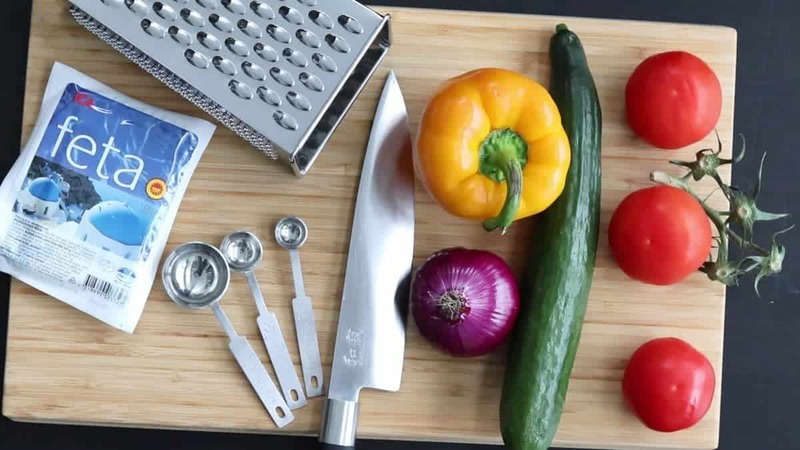 Want to up your Chopping Game? The links below are Amazon affiliate links which means that if you buy something through one of my links I receive a small commission (at no extra cost to you). You are very welcome Fiona, and thanks for commenting!